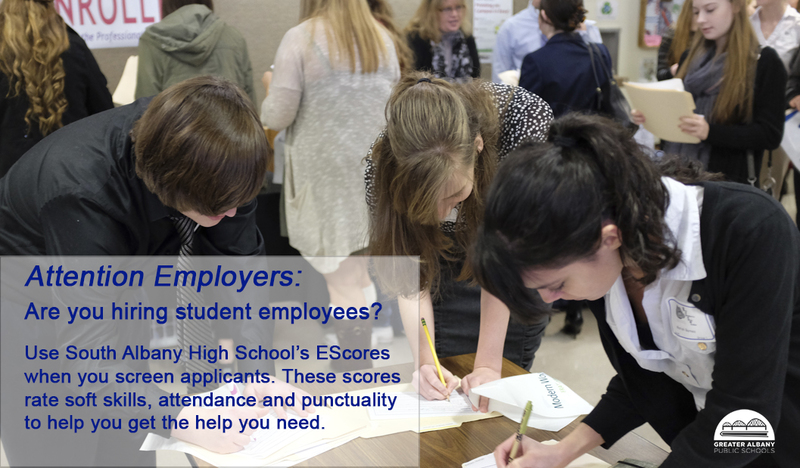 Local employers have heard of South Albany High School’s EScore program, which rates and reports students’ soft skills to help with hiring. Now other school district’s are taking note and adopting the program. Read about the Scio School District’s EScore program adoption in the Democrat-Herald: Scio joins E-score program. The program, now in its third year, grew out of a partnership with the Albany Chamber of Commerce. It isn’t about grades; rather, it scores the habits that would translate to the work environment for entry level jobs. Students get EScores that are reported to them and their parents and can be shared with potential employers. 30% – Teacher evaluations of ability to work well with others and complete tasks in a timely manner. Read more about the SAHS EScore program.